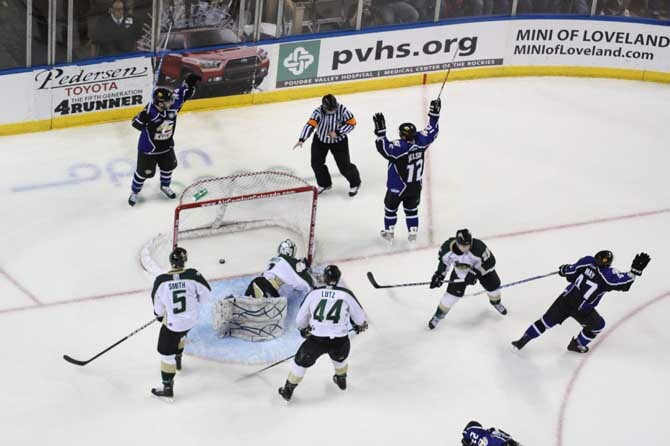 LOVELAND, Colo. – The Colorado Eagles topped the Mississippi RiverKings 5-1 at the Budweiser Events Center. Andrej Hebar and Riley Nelson each scored a pair of goals in a dominating performance for the Eagles who kept pace with the Rapid City Rush in the battle for first place in the Turner Conference. The Eagles swarmed the RiverKings in the opening period, out-shooting them 15-7 and having several strong scoring chances. With Mississippi committing several turnovers in their own zone, the scoring opportunities came early and often for Colorado, but they failed to convert on several of them. Even so, Colorado took a 2-goal lead on consecutive shots, the first one coming before the ‘Kings registered a shot on goal. At 5:32, Adam Hogg sent the puck from below the goal line in the left corner toward the doorstep where Matt Glasser deflected a shot that slid past Alexander Pechurskiy. Fewer than 45 seconds after that, Hebar made it 2-0 with a great individual effort for his first goal as an Eagle. The Slovenia native helped keep the puck in the offensive zone with a pass across the blue line to Dylan Stanley, then made his way toward the net. Stanley, playing in his first game since Jan. 21, sent the puck back to Hebar for a pretty deflection over the Mississippi netminder. The Eagles had a similar spurt of scoring chances midway through the second stanza, but Pechurskiy kept his team in the game with some stellar saves. And at 12:02, Mississippi cut Colorado’s lead in half when Rusty Masters’ shot from atop the left circle deflected past Kyle Jones. Colorado’s captain would counter that score with a pair of goals before the end of the period to send the Eagles into the third up 4-1. Nelson’s first score came at 17:15 after a Dan Sullivan hit along the boards at center ice loosened the puck for Adam Chorneyko to take into the offensive zone. Nelson took the puck from the rookie inside the zone and beat the ‘Kings goalie to make it 3-1. And with just 7.8 seconds left in the second session, Nelson knocked home a rebound on a 5-on-3 power play to make it 4-1. The highlight of the third period — at least for the home crowd — came at 4:23 when a skirmish resulted in linesman Chris Wilson tackling defenseman Joe Grimaldi away from a fight already in progress. Assistant Coach Greg Pankewicz, infuriated by Wilson’s actions, angrily screamed from the bench before tossing several of his articles of clothing onto the ice. After several penalties were handed out to each team, the rest of the period played out without a hitch. And at 16:03, Hebar made it 5-1 when he converted on a penalty shot, pulling up in the low slot and snapping a low shot past the ‘Kings’ goalie. The Eagles will take on the first-place Rush on Wednesday at the BEC.